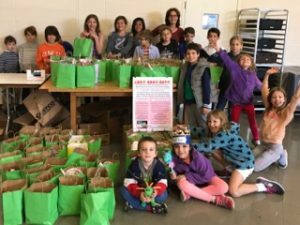 So far, No Child Goes Hungry has provided twenty grants working with more than a dozen groups, including churches and ethical societies, schools, environmental conservancy groups and individuals in nine different states and the District of Columbia. No Child Goes Hungry began with private donations from individuals and a family foundation. In 2016, the organization gained 501(c)3 status. NCGH now focuses on expanding its outreach by raising funds to broaden the reach of hunger advocacy work. Private donations, grants and fundraisers are the lifeblood of our support. When a grant is awarded to an organization, Rev. Kären mentors the leaders of the specific group as they build their hunger advocacy projects. Every grant bestowed by NCGH is meant to be a springboard, and the hope is the recipients will be able to raise or contribute funds on their journey to become self-sufficient initiatives. Each organization has the flexibility to develop a program that works best in their own communities to feed children. Individual donations can be made below. If you would like to sponsor a fundraiser to support NCGH, or are an organization that would like to make a corporate donation, please contact us here.